Allows Multi-Max accessories (excluding multi-flex) to fit all current oscillating tools from Fein, Rockwell, Bosch, Craftsman, Rigid and more. Use to remove scratches. Provides a natural or high luster to soft metals like aluminum, copper, brass and pewter. Also for use on plastics, Plexiglas, poly, wood finishes etc. Use to remove scratches. Provides a natural or high luster on hard metals like steel, iron, stainless etc. Use to remove scratches. Provides a natural or high luster to hard metals like steel, iron, stainless, etc. Use to remove scratches. Provides a natural or high luster on soft metals like aluminum, copper, brass, pewter etc. Also for precious metals like gold and silver. Adaptor for Rockwell SoniCrafter Hex interface model. This complete kit contains 1 universal back up pad and 3 stick-on sanding discs. The 1/4" arbor is designed to fit any electric drill. The sandpaper attaches to the hook and loop sanding pad. Use to remove excess wood, finish and paint for faster surface removal in smaller areas. The holes in the paper allow for dust collection through the pad, resulting in cleaner and faster detailed sanding. The sandpaper attaches to the hook and loop sanding pad. Use to remove excess wood, finish and paint for faster surface removal in smaller areas. The holes in the paper allow for dust collection through the pad, resulting in cleaner and faster detailed sanding. For metal cutting. Triangle type; fine grade. Mesh sandpaper is washable and cleaning the mesh minimizes clogging. Universal dust extraction. Hook and loop attachment. Suitable with oscillating tools. For metal cutting. Triangle type; medium grade. Mesh sandpaper is washable and cleaning the mesh minimizes clogging. Universal dust extraction. Hook and loop attachment. Suitable with oscillating tools. Sand paper accessory allows the Multi-Max to sand paint, varnish, filling compound on a variety of surfaces. Includes two each of 80, 120 and 240 grit. Requires MM11 Hook and Loop pad accessory (784.7205). Use with 122.5929. 12 hook and loop sanding triangles: (3) 60G, (3) 80G, (3) 120G and (3) 240G. For use with most detail sanders and all brands of Multi-Purpose oscillating tools. Adapts Universal Fit accessories to fit onto prior model Sonicrafter tool with hex interface. Universal fit system allow accessory to fit all major brand oscillating tools. Constructed from carbide with a cutting depth of 1", used to cut ceramic tile, cement board, stucco, and plaster. Replacement flange for the SoniCrafter tool. Includes: screw, flange and allen key. Self storing design springs back into coiled shape. Rugged oil and abrasion resistant polyurethane construction. Leak resistant, 360 degree swivel brass end connectors. Spring bend restrictors prevent kinks near hose end. 1/4" NPT; maximum working pressure at 100 psi. Kit Includes: 1 each half tubes of the Jeweler's Rouge, Emery, Stainless and Tripoli. Retains its self-coiling properties and stores itself when finished. Can be used with all air-powered equipment on the job site and in garages, plants and service stations. Swivel end fittings on one side reduce hose twist. Temperature range: 32-degree F to 120-degree F. 200 PSI. Yellow 5" Sanding disc kit for drills includes: (2) Ultra coarse/fast removal 40 grit pads, (2) coarse/removal 80 grit pads and (1) fine/final prep 120 grit pad. For use on wood, metal and plastics. Clog-Shield, Diablo's own blend of grinding agents, reduces loading, thus maximizing productivity. Constructed from high speed steel with a shank of 1/8", cuts all types of wood, wood composites, fiberglass, solid surface materials, vinyl and aluminum siding, plastic and laminates. High-carbon steel cutting edge for general purpose wood cutting applications. Curved Tec blade design for greater control and smooth, precise plunge cuts. Color coded interface and laser etched blade to quickly identify the right blade. Starlock interface for professional performance, also works with OIS compatible tools including Bosch, Fein, Milwaukee, Makita, Rigid and others. Precision Swiss made blade for accuracy and long life. Aggressive flush cuts and plunge cuts in wood, plastic, drywall and other soft materials up to 1-9/16" deep. Beveled tooth design for maximum blade durability and versatility. Special design creates cleaner, more accurate flush cuts. For use with all brands of Multi-purpose oscillating tools. Rigid scraper blade for removal of vinyl flooring, bonded carpeting, old coats of varnish/paint and adhesives. Flexible scraper blade for removal of caulk, coats of peeling paint and soft adhesives. For use with all brands of multi-purpose oscillating tools. For plunge cuts and flush cuts in wood, plastic, drywall and other soft materials up to 1-9/16" deep. Use with all brands of multi-purpose oscillating tools. For removing old vinyl, wood or other floor coverings, paint and coatings, residues and separating laminated layers and cuts carpets. Universal fit system allow accessory to fit all major brand oscillating tools. For removing elastic sealants, paint adhesive residues, wallpaper, worn gaskets, etc. Cuts carpet, leather, linoleum and similar materials. Universal fit system allow accessory to fit all major brand oscillating tools. One piece pad/mandrel assembly attaches easily to standard household drill (1/4", 3/8", 1/2") for removing paint from wood and metal surfaces. Features Scotch-Brite abrasive web that will not rust or splinter like wire brushes. Conforms to surface contours and reduces gouging. Use 2-disc on 1 mandrel, or double-wide for longer, tougher jobs. Removes paint and varnish from contoured surfaces. Mounts directly to power drills by inserting the mandrel into a drill chuck. Fits: All Household Drills. Applications: Removing Paints, Varnishes, Rust; Sanding, Polishing & Buffing. 1/4" shaft. For removal of stubborn caulk, paint, adhesive residue, tile adhesive and window putty. For sawing. Detailed plunge cuts up to 1-5/8" depth in non-metal materials. High-Carbon steel. 16 teeth per inch. For removing deep penetrating adhesive, caulking, silicone and other soft bonding materials up to 3" deep. For use with all brands of Multi-Purpose oscillating tools. Fits electric drills. For removing surface defects on metal, wood, plastic and fiberglass. For stripping paint and primers. The open-webbed, semi-flexible design of this wheel makes it easy to strip edges, contours and even surface without gouging. Silicon carbide grain is uniformly distributed throughout the wheel, allowing for aggressive removal of paint and rust. Blade is used for making precise cuts in wood, plaster, drywall material in such applications as cutting openings in flooring for venting, repairing damaged flooring and cutting openings for electrical boxes; can also be used for window restoration to remove glazing. Use with 122.5929. For general purpose plunge cutting up to 1-5/8" depth in non-metal materials like wood, plastic and drywall. Universal fit system allow accessory to fit all major brand oscillating tools. Blade width - 1-3/8". Made of high speed steel with a cutting depth 1-1/2 ", used for basic drywall cut-outs, when a slower, controlled cut of outlet boxes in drywall is needed. For general purpose plunge cutting up to 1-5/8" depth in non-metal materials like wood, plastic and drywall. Universal fit system allow accessory to fit all major brand oscillating tools. Made of high speed steel with a cutting depth of 1" and shank size of 5/32", used for cutting drywall. 2 per card. Holds sanding sheet for detail sanding in very small areas, openings and corners. Use on wood plastic and hardened fillers. For sawing. Bi-Metal for longer life cutting in wood with nail applications. 1-5/8" plunge depth. 18 teeth per inch. For removal of stubborn paint, adhesive residue, tile adhesive and window putty. Great for cutting carpet and old laminate. For sawing. General purpose plunge cuts up to 1-5/8" depth in non-metal materials. High-Carbon steel. 12 teeth per inch. One piece pad/mandrel assembly attaches easily to standard household drill (1/4", 3/8", 1/2") for removing paint from wood and metal surfaces. Features Scotch-Brite abrasive web that will not rust or splinter like wire brushes. Conforms to surface contours and reduces gouging. Use 2-disc on 1 mandrel, or double-wide for longer, tougher jobs. Bi-metal 1-3/8" blade for plunge cuts and flush cuts in nails, nail-embedded wood, copper, aluminum, other non-ferrous metals, mild steel, wood, plastic, drywall and other soft materials up to 1-9/16" deep. For use with all brands of multi-purpose oscillating tools. Used to turn power drills into a stripper. Attaches to a 3M hook and loop back-up pad for use on flat projects requiring fast removal of surface paint and rust from wood, metal, and plastic. For controlled drywall cut-outs around electrical boxes and framing, 1/8" shank. For plunge cutting up to 1-5/8" depth on wood, plastic, fiberglass, nails, non-ferrous metals, thin sheet metal and hardened fillers. Universal fit system allow accessory to fit all major brand oscillating tools. For plunge cutting up to 1-5/8" depth on wood, plastic, fiberglass, nails, non-ferrous metals, thin sheet metal and hardened fillers. Universal fit system allow accessory to fit all major brand oscillating tools. Precision-ground, beveled tooth design allows for aggressive plunge cutting up to 1-5/8" depth on wood and soft plastics. Constructed from high speed steel with a cutting depth of 1" and a shank of 5/32", for use with cut out tools. Allows the Multi-Max oscillating tool to accept sand paper and diamond paper. Quick-fit design allows for fast accessory changes. Compatible with all dremel multi-max tools. Precision-ground, beveled tooth design allows for aggressive plunge cutting up to 1-5/8" depth on wood and soft plastics. Low profile design gets into tight spots. High-density hook and loop attachment system holds accessories securely. Ideal for detail sanding jobs utilizing quick attach hook and loop sandpaper. For use with all brands of Multi-Purpose Oscillating tools. For plunge cutting up to 3/4" depth on wood, plastic, fiberglass, nails, non-ferrous metals, thin sheet metal and hardened fillers. Universal fit system allow accessory to fit all major brand oscillating tools. Flexible scrapers are used for hard to reach areas and removal of soft materials such as caulk. Make sure the blade is flexed during the scraping process. A 30 to 45 degree pitch is recommended. Use with 122.5929. Used for precise cuts and plunge cuts. Designed for cutting wood, drywall, plastic, and soft metal. Applications include flush cutting doorjamb or windowsill, for flooring or tile installation. 1-1/4" depth of cut. For removing sealant, paint and glue. High-carbon steel edge for removing touch sealants. Tapered design is perfect for tight spaces. Color coded interface and laser etched blade to quickly identify the right blade. Starlock interface for professional performance. Also works with OIS compatible tools including Bosch, Fein, Milwaukee, Makita, Rigid and others. Precision Swiss made blade. Blade thickness: 0.125"; Blade length: 4.0". Used to turn power drills into a stripper. Attaches to a 3M hook and loop back-up pad for use on flat projects requiring fast removal of surface paint and rust from wood, metal, and plastic. For sawing. General purpose plunge cuts up to 1-5/8" depth in non-metal materials. 12 teeth per inch. High-Carbon steel. 15 TPI coarse tooth blade for fast plunge cuts and flush cuts in wood, plastic, drywall and other soft materials up to 2-1/4" deep. For use with all brands of Multi-Purpose Oscillating tools. For continuous cutting in wood, drywall, plastic, copper, aluminum, other non-ferrous metals, and other soft materials. Use with all brands of multi-purpose oscillating tools. For sanding wood, paint, hardened fillers and other similar construction materials. For use on all major brands. No adapter required. Design allows for long life of sanding pad. Universal fit for use on all brands of oscillating tools. Constructed from carbide with a cutting depth of 1", used to cut ceramic tile, cement board, stucco, and plaster. Rigid oscillating blade for scraping. Universal fit compatible with Fein, Bosch, Dremel, Rockwell, Porter-Cable and other brands. For detail sanding in small areas and corners. Use with extraction attachment for dust removal. Use on wood, plastic and hardened fillers. Perforated. For removing old vinyl, wood or other floor coverings, paint and coatings, residues and separating laminated layers and cuts carpets. Universal fit system allow accessory to fit all major brand oscillating tools. Use to strip away rust, corrosion, scale, paint and epoxy. Large area removal of harder materials such as vinyl flooring and bonded carpeting or scraping off coats of paint, varnish or adhesives. Blade is 5.5"x3.9". Use with 122.5929. Removes paint and varnish from contoured surfaces. Mounts directly to power drills by inserting the mandrel into a drill chuck. Fits: All Household Drills. Applications: Removing Paints, Varnishes, Rust; Sanding, Polishing & Buffing. 1/4" shaft. For sawing. Japanese teeth for precision cutting in hardwoods up to 1-5/8" depth. High-Carbon steel. 14 teeth per inch. Tackle tough scraping applications with Dewalt oscillating scraping blades. Crafted from steel for long life and durability. Each blade is compatible with all major oscillating tool brands. Power brushless motor provides 5200 rpm maintaining speed under load. Flexible mushroom style head for light material removal such as paint and rust. 7-1/4" capacity blade provides 2-9/16" cutting capacity at 90 degrees. Orange glo, long life engineered composition PVC hose. Spiral reinforced hose for durability. Nonconductive and oil and abrasion resistant; 1/4" NPT brass fittings on both ends. 3M exclusive disc for Paint Eater removes paint chips, feather the edges and abrades surfaces for a smoother finish. Open-web design minimizes the load up of paint and dust. Use with PaintEater removal tool (948.9212). Tackle tough scraping applications with the Dewalt oscillating scraper blade. Crafted from steel for long life and durability. Each blade is compatible with all major oscillating tool brands. Power brushless motor provides 5200 rpm maintaining speed under load. Rigid body for long life. 7-1/4" capacity blade provides 2-9/16" cutting capacity at 90 degrees. Universal fit. Serrated edges for easy material removal. Diameter: 0.73". Size: 3". Thickness: 0.73". For removing sealant, paint and glue. High-carbon steel edge for removing tough sealants, adhesives and paint. Rigid design for scraping applications. Color coded interface and laser etched blade to quickly identify the right blade. Starlock interface for professional performance. Also works with OIS compatible tools including Bosch, Fein, Milwaukee, Makita, Rigid and others. Precision Swiss made blade. Blade thickness: 0.125"; Blade Length: 4.0". With carbide edging for aggressive material removal, Dewalt oscillating grout removal blades are compatible with all major oscillating tool brands. No adapter required. Universal fit for use on all major brands. Diamond grit for fast cuts in tough applications. Diameter: 0.73". Size: 3". Thickness: 0.73". Retains its self-coiling properties and stores itself when finished. Can be used with all air-powered equipment on the job site and in garages, plants and service stations. Swivel end fittings on one side reduce hose twist. Temperature range: 32-degree F to 120-degree F. 200 PSI. Yellow For sawing. Japanese teeth for precision cutting in hardwoods up to 1-5/8" depth. High-Carbon steel. 14 teeth per inch. For sawing. General purpose plunge cuts up to 2-5/8" depth in non-metal materials. High-Carbon steel. 15 teeth per inch. 3/8", 3/4" and 1-1/4" flush cut (e-cut) blades for plunge cuts and flush cuts in wood, plastic, drywall and other soft materials up to 1-9/16" deep. For use with all brands of multi-purpose oscillating tools. For linear and plunge cutting. Use on thin wood, plastic, fiberglass, non-ferrous metals, thin sheet metal, hardened fillers and window glazing. Semicircle. Universal fit system allow accessory to fit all major brand oscillating tools. Includes 4 pieces of each- 40, 80, 120, 180, and 220 grit. Hook and loop paper retention. Use with RW9147 (Orgill SKU# 325.4372). Allows you to cut through laminate flooring with ease. Carbide bit developed specifically for excellent performance and long-life in cutting laminate flooring. Also cuts through hard and soft wood flooring, plywood, and other wood-based materials. For sawing. Titanium enhanced Bi-metal for longer life cutting in wood with nail applications. 1-5/8" plunge depth. 18 teeth per inch. Use for flush cutting doorjamb or windowsill, flooring or tile installation, or squaring off rounded corners. High-carbon steel blade for precision wood cutting. May be used on wood, plastic, drywall and other soft materials. 1-11/16" depth of cut. Constructed from high speed steel with a cutting depth of 1" and a shank of 5/32", for use with cut out tools when cutting underlayment. Ideal for a wide range of home and job-site applications. 3/8". Simple and convenient storing, without taking away the needed length required on the job-site. 300 psi. For fast, efficient sanding of medium sized areas. The alternative to random orbit or pad sanders. No kickback on edges. Easy operation, excellent removal rate. Can be used with our without dust extraction. Plastic carrier plate to prevent damage and marks on the work piece. Round shape, perforated version, hook and loop surface. Includes (1) sanding disc 4-1/2" diam., perforated, (2) sanding sheets of 60, 80 and 180 grit each, perforated. Universal fit for adapter free use with all major oscillating tool brands. Durable enough to tackle tough jobs. Easily cut through wood with this oscillating fast cut wood blade. Includes 2 washers. Length: 1-3/4". Size: 1-1/4". Thickness: 0.75". The fast cutting drywall jab saw offers the ideal solution for cutting drywall with your Multi-Max oscillating tool. Designed to make both straight and curved cuts, the jab saw's offset design and sharpened tip allow plunge cutting with not pilot hole needed. Cuts around electrical boxes and recessed lighting quickly and easily. The blade is newly designed, utilizing Dremel's Universal quick fit interface for compatibility with most oscillating tools. Made of braid reinforced blue polyurethane hose. Lightweight and flexible; features bend restrictors. Stays flexible,-30 to 150 degrees F. 300 PSI. For coarse grinding or rasping and aggressive material removal in small tight areas. Use on wood, hardened adhesives, thin set and masonry. 2.5" Carbide grit finger shaped. Universal fit system allow accessory to fit all major brand oscillating tools. With carbide edging for aggressive material removal, Dewalt oscillating grout removal blades are compatible with all major oscillating tool brands. No adapter required. Universal fit. Carbide edging for grout removal. Diamond grit for fast cuts in tough applications. Diameter: 0.7". Size: 3". Thickness: 0.7". For aggressive material removal of wood, tile adhesives, cement and mortar. For use with all brands of Multi-Purpose oscillating tools. Built to cut through metal, carbide constructed, high speed bit cuts up to 18 gauge steel, use for HVAC, steel studs, aluminum siding and more, bit tip allows for plunging directly into the work piece for easy cut start. Kit is used to turn a drill into a sander; for use on wood, metal, and plastic. Includes: 5" disc pad and (3) sanding discs one each: 40, 80 and 120 grit. For sawing. Titanium enhanced Bi-metal for longer life cutting in metal and wood applications. 2-1/8" plunge depth. 18 teeth per inch. For sawing. Titanium enhanced Bi-metal for longer life cutting in wood with nail applications. 1-5/8" plunge depth. 18 teeth per inch. Ideal for cutting wood with nails. Universal fit for use on all major brands (no adapter required). For removing grout from floor or wall tiles for replacement or restoration. Use with all brands of Multi-Purpose Oscillating tools. Double-row Japanese toothing for all wood materials, plasterboard and soft plastics. For fast work progress and maximum precision. Extra wide shape for maximum cutting performance and long straight cuts. For cutting iron bar, black pipe, metal (nails and staples), wood with nails, drywall and ceramic. Carbide teeth for high performance in metal and other materials. Color coded interface and laser etched blade to quickly identify the right blade. Starlock interface for professional performance, also works with OIS compatible tools including Bosch, Fein, Milwaukee, Makita, Rigid and others. Precision Swiss made blade. Blade thickness: 0.125". Multi-material cutting blade is ideal for cutting asphalt shingles. Compatible for Fein, Bosch, Dremel, Rockwell, Porter-Cable and other brands. Constructed from carbide with a cutting depth of 1" and a shank of 1/4", used to cut cement board, stucco and plaster, Premium carbide teeth for long life in tough applications. Featuring Universal Fitment for adapter free use with all major oscillating tool brands. Durable for tough jobs. Diamond grit for long life. Applicable Materials: Hardwood with nail. Thickness: 3/4". For linear and plunge cutting on thin wood, plastic, fiberglass, non-ferrous metals, thin sheet metal, hardened fillers and window glazing. Universal fit system allow accessory to fit all major brand oscillating tools. Quality multi-purpose air hose. Light weight, flexible, kink-resistant design. 300 PSI. For cutting wood, wood with nails, drywall, pvc, metal (nails and staples). Bi-metal cutting edge for all-purpose applications including wood with nails. Curved Tec blade design for greater control and smooth, precise plunge cuts. Color coded interface and laser etched blade to quickly identify the right blade. Starlock interface for professional performance, also works with OIS compatible tools including Bosch, Fein, Milwaukee, Makita, Rigid and others. Precision Swiss made blade. Blade thickness: 0.125". For sawing. Plunge cutting up to 1-5/8" depth. Bi-metal with hardened, titanium-coated teeth for longevity. 18 teeth per inch. 4.5" clog resistant disc. For stripping all coatings and surfaces. Long lasting. Contains 1 disc. Orange glo, long life engineered composition PVC hose. Spiral reinforced hose for durability. Nonconductive and oil and abrasion resistant; 1/4" NPT brass fittings on both ends. Self storing design springs back into coiled shape. Rugged oil and abrasion resistant polyurethane construction. Leak resistant, 360 degree swivel brass end connectors. Spring bend restrictors prevent kinks near hose end. 1/4" NPT; maximum working pressure at 100 psi. Perforated for use with dust extraction kit. Hook & loop. For universal sanding applications. Includes four each: 40, 80, 120, 180, 220 grit sanding sheets. Bi-metal with wavy universal toothing. Broad application spectrum for sheet metal up to 1/16", aluminum profile, copper pipes, wood, plasterboard and plastics. Wide, waisted shape for optimal cutting speed and good swarf removal. High carbon steel cutting edge for general purpose wood applications. Curved Tec blade design for greater control and smooth, precise plunge cuts. Color coded interface and laser etched blade to quickly identify the right blade. Starlock interface for professional performance. Also works with OIS compatible tools including Bosch, Fein, Milwaukee, Makita, Rigid and others. Precision Swiss made blade. Blade thickness: 0.125"; Blade size: 1-1/4". For cutting wood, hardwood and laminate. Bi-metal oscillating blade is ideal for cutting metal. Titanium coated for long life. Compatible with Fein, Bosch, Dremel, Rockwell, Porter-Cable and other brands. Bi-metal with teeth set for all woods, plasterboard and plastic materials. Very clean cut and excellent work progress. Medium width, waisted shape for optimal cutting speed and good swarf removal. 1-3/8" Width x 2" Length. Extremely robust, unaffected by nails in wood (up to approximately 3/16" diam. ), masonry, etc. Bi-metal with teeth set for all woods, plasterboard and plastic materials. Very clean cut and excellent work progress. Extremely robust, unaffected by nails in wood (up to approximately 3/16" diam. ), masonry, etc. 2-9/16" width x 2" length. Wide shape for maximum cutting performance and long straight cuts. Bosch Saw Blade, Flush Cut, Suitable For Use With: 6300, 8300, MM20 and MM40 Oscillating Tools, 7/8 in Size, Bi-Metal, 3.9 in Length, For Cutting Openings in Wood and Metal, Flooring for Venting, Repairing Damaged Flooring and Cutting Openings for Electrical Boxes, Window Restoration to Remove Glazing For coarse grinding or rasping and aggressive material removal over larger areas. Use on wood, hardened adhesives, thin set and masonry. Triangular carbide grit. Universal fit system allow accessory to fit all major brand oscillating tools. Flush cut saw blade for oscillating multi-tool. Used for faster and larger cuts. The 4" width and 270 degree cutting surface provides a larger cutting area. This high carbon steel blade will cut multiple materials such as pvc, wood and drywall. The tool free fit allows users to change accessories quickly. Hook and loop system holds disc securely, fits all standard household drills and is reusable; Used for paint, wood, and metal. Includes: 3M Hookit disc pad, 3M Hookit sanding discs. For plunge cuts and flush cuts in nails, nail-embedded wood, copper, aluminum, other non-ferrous metals, mild steel, wood, plastic, drywall and other soft materials up to 2-1/4" deep. 5 times the durability of regular bi-metal blades. For use with all brands of Multi-Purpose oscillating tools. Oscillating saw blade. Universal fit system adapts to other brands. 3-1/8" carbide grit for oscillating tools. Use to remove grout, porous concrete and masonry. Semi-circle shape with flat side allow for easy access into corners and flush against adjoining surfaces. For wide plunge cuts up to 1-5/8" depth in wood, plastic, fiberglass, drywall, nails, non-ferrous metals, thin sheet metal and hardened fillers. Bi-metal with hardened teeth to cut non-ferrous metals. Universal accessory fits all tools. For aggressive plunge cutting up to 1-5/8" depth in wood, plastic, drywall, fiberglass, nails, non-ferrous metals, thin sheet metal and hardened fillers. Precision ground, beveled tooth design. Bi-metal with hardened teeth to cut non-ferrous metals. Universal accessory fits all tools. For wide, aggressive plunge cutting up to 1-5/8" in wood, plastic, drywall, fiberglass, nails, non-ferrous metals, thin sheet metal and hardened fillers. Precision ground, beveled tooth design. Bi-metal with hardened teeth to cut non-ferrous metals. Universal accessory fits all tools. High speed steel oscillating tool blade. Efficient hybrid design for precise cutting and sawing in non-metal materials. Cuts plastic, PVC, wood and drywall materials. Universal accessory fits all tools. High speed steel oscillating tool blade. For aggressive plunge cutting up 1-5/8" depth into wood, drywall and soft plastics. The precision ground, beveled tooth design. Abrasive surface on the backside allows for sanding/finishing rough cuts. Universal accessory fits all tools. Short version. For removal of stubborn paint, adhesive residue, carpet, tile, adhesive and under seal. Bi-metal with wavy universal toothing. Broad application spectrum for sheet metal up to 1/16", aluminum profile, copper pipes, wood, plasterboard and plastics. Wide, waisted shape for optimal cutting speed and good swarf removal. Set teeth for all woods, plasterboard and plastic materials, very clean cuts and good cutting speed. Medium width, waisted shape for optimal cutting speed and good swarf removal. 1-3/8" width x 2" length. Cuts through a large variety of materials. Quick Fit interface allows for capability with most oscillating tool brands. Includes: 1-1/4" Wood and Metal Flush cut blade, 1-1/4" Wood Flush Cut blade and 3" Wood and Drywall blade. Premium carbide teeth for long life in tough applications. Featuring Universal Fitment for adapter free use with all major oscillating tool brands. Durable for tough jobs. Diamond grit for long life. Applicable Materials: Hardwood with nail. Thickness: 3/4". Black/Titanium Coated Finish. Premium carbide teeth for long life in tough applications. Featuring Universal Fitment for adapter free use with all major oscillating tool brands. Durable enough to tackle tough jobs. Diamond grit for long life. Applicable materials: Hardwood with nails. Black finish. Thickness: 0.7". For cutting wood, wood with nails, drywall, pvc, metal (nails and staples). Bi-metal cutting edge for all-purpose applications including wood with nails. Curved Tec blade design for greater control and smooth, precise plunge cuts. Color coded interface and laser etched blade to quickly identify the right blade. Starlock interface for professional performance, also works with OIS compatible tools including Bosch, Fein, Milwaukee, Makita, Rigid and others. Precision Swiss made blade. Blade Thickness: 0.125"; Blade Length: 4.0". High speed oscillating tool blade. For slicing, ripping, or scraping soft materials and hardened adhesives. Universal accessory fits all tools. Fast wood cutting oscillating blade. Universal fit is compatible with Fein, Bosch, Dremel, Rockwell, Porter-Cable and other brands. Flexible Hybrid Polymer material permits use in environments where general purpose PVC and rubber hose may become too stiff. Flexzilla hose characteristics offer zero memory allowing it to lay flat. It won?t work against you during operation and coils easily after use. It also offers extreme all-weather flexibility, even in subzero conditions, and is ideal in both hot and cold environments where tight radius bends are needed. Anodized aircraft aluminum ends. Max working pressure at 70 degrees Fahrenheit, 300 PSI. Flush cutting blade with high performance carbide teeth for longer life. Users can cut hardwoods, nails, screws, stainless steel bolts, galvanized pipe, plaster and lathe, cement board, fiber board, sheet metal, slate, ceramic tile and more. It's wide 1-1/4" blade speeds through long cuts and can make plunge cuts up to 1-11/16" deep. Universal Quick Fit system allows this blade to fit nearly every oscillating tool on the market. Bi-metal blade with xtra-clean cutting edge for clean cuts in hard wood, cutting wood and laminate. Curved Tec blade design for greater control and smooth, precise plunge cuts. Color coded interface and laser etched blade to quickly identify the right blade. Starlock interface for professional performance. Also works with OIS compatible tools including Bosch, Fein, Milwaukee, Makita, Rigid and others. Precision Swiss made blade. Blade Thickness: 0.125". Blade Length: 4.0"
Made of high speed steel with a cutting depth of 1" and a shank size of 5/32", used with cut out tools for cutting drywall. Double-row Japanese toothing for all wood materials, plasterboard and soft plastics. For fast work progress and maximum precision. Extra wide shape for maximum cutting performance and long straight cuts. Premium carbide teeth for long life in tough applications. Featuring Universal Fitment for adapter free use with all major oscillating tool brands. Durable enough to tackle tough jobs. Diamond grit for long life. Applicable materials: Wood and mold. Black finish. Thickness: 0.7". Standard version. Plastic carrier plate to prevent damage and marks on the work piece. Triangular shape, hook and loop surface. Extremely lightweight and flexible air hose provides ideal performance in all climates. Solid brass fittings: 1/4" - 18 NPT. Oil and abrasion resistant. Heavy duty braided reinforcement. Working temperature range from 30 to 150 degrees F. Maximum working pressure of 250 psi. Blade is used for making precise cuts in wood, plaster, drywall material in such applications as cutting openings in flooring for venting, repairing damaged flooring and cutting openings for electrical boxes; can also be used for window restoration to remove glazing. Use with 122.5929. Spyder Oscillating Saw Blade, Universal Offset, Series: 700001, Medium, Bi-Metal, Applicable Materials: Wood, Wood with Nails, Drywall Plastic, Non-Ferrous Metals and Fiberglass General purpose use bi-metal oscillating blade. Titanium coated for long life. Compatible with Fein, Bosch, Dremel, Rockwell, Porter-Cable and other brands. Set teeth for all woods, plasterboard and plastic materials. Very clean cuts and good cutting speed. Wide shape for maximum performance and long straight cuts. 2-9/16" width x 2" length. Flexible Hybrid Polymer material permits use in environments where general purpose PVC and rubber hose may become too stiff. Flexzilla hose characteristics offer zero memory allowing it to lay flat. It won?t work against you during operation and coils easily after use. It also offers extreme all-weather flexibility, even in subzero conditions, and is ideal in both hot and cold environments where tight radius bends are needed. Anodized aircraft aluminum ends. Max working pressure at 70 degrees Fahrenheit, 300 PSI. For cutting iron bar, black pipe, metal (nails and staples), wood with nails, drywall and ceramic. Carbide teeth for high performance in metal and other materials. Color coded interface and laser etched blade to quickly identify the right blade. Starlock interface for professional performance, also works with OIS compatible tools including Bosch, Fein, Milwaukee, Makita, Rigid and others. Precision Swiss made blade. Blade thickness: 0.125". Grout blade is is able to remove all grout up to the surface of a wall or corner in repair, remodeling and restoration work. Blade is 2-1/2". Use with 122.5929. Grout blade is is able to remove all grout up to the surface of a wall or corner in repair, remodeling and restoration work. Blade is 2-1/2". Use with 122.5929. Bi-metal material for increased life. Universal fit for use on all major brands (no adapter required). For sawing. Ideal for hard to reach applications such as cabinet toe kicks to remove flooring. 1" cutting depth. Bi-Metal Material. Ultra Air takes hybrid to a new level, offering increased cold weather flexibility over competitive hoses. When uncoiled, this hose lays flat making it easier to use with no interruption in air flow or tripping hazards. Lighter in weight than rubber and more flexible than PVC; features bend restrictors. Stays flexible, -40 to 150 degrees F. 300 PSI. Solid HSS saw blade with metal toothing for sheet metal up to approximately 1/16". Also for plastics, wood, glazing, compound, brass and bronze. Clean, narrow cutting line. Ideal cutting speed. Segmented, for working in corners and on edges without over cut. 3-3/8" blade diameter. For general purpose plunge cutting up to 1-5/8" depth in non-metal materials like wood, plastic and drywall. Universal fit system allow accessory to fit all major brand oscillating tools. Blade width - 1-3/8". For cutting iron bar, black pipe, metal (nails and staples), wood with nails, drywall and ceramic. Carbide teeth for high performance in metal and other materials. Color coded interface and laser etched blade to quickly identify the right blade. Starlock interface for professional performance, also works with OIS compatible tools including Bosch, Fein, Milwaukee, Makita, Rigid and others. Precision Swiss made blade. Blade thickness: 0.125". For linear, plunge and flush cuts in a variety of materials such as thin wood, plastic, drywall, fiberglass, non-ferrous metals, thin sheet metal, hardened fillers and window glazing. Bi-metal with hardened teeth to cut non-ferrous metals. Universal accessory fits all tools. Flexible Hybrid Polymer material permits use in environments where general purpose PVC and rubber hose may become too stiff. Flexzilla hose characteristics offer zero memory allowing it to lay flat. It won?t work against you during operation and coils easily after use. It also offers extreme all-weather flexibility, even in subzero conditions, and is ideal in both hot and cold environments where tight radius bends are needed. Anodized aircraft aluminum ends. Max working pressure at 70 degrees Fahrenheit, 300 PSI. For removing grout, cutting and shaping plaster, porous concrete and masonry. For course grinding or rasping for aggressive material removal over larger areas. Universal accessory fits all tools. 3-1/8" Carbide grit semicircle grout removal and rasp. Made of braid reinforced blue polyurethane hose. Lightweight and flexible; features bend restrictors. Stays flexible,-30 to 150 degrees F. 300 PSI. Ideal for a wide range of home and job-site applications. 3/8". Simple and convenient storing, without taking away the needed length required on the job-site. 300 psi. For coarse grinding of filler material, tile adhesive, concrete, stone and wood. Triangular shape, 3-1/8" edge length. Perforated. Can also be used with dust extraction. Bi-metal oscillating blade general purpose blade. Titanium coated for long life. Universal fit compatible with Fein, Bosch, Dremel, Rockwell, Porter-Cable and other brands. For grinding. For quick sanding of mortar under broken tiles, concrete, stone and woods. Max-Fusion carbide. For grinding purpose. Use for grout removal and cutting grooves in plaster and porous concrete. Kerf up to 1/32". Max-Fusion carbide. For sawing purpose. Ideal for cutting wood, fiberglass and sheet metal. Titanium high-speed steel. 18 teeth per inch. Designed for light grinding, shaping and smoothing. Ideal for use on masonry, thin-set, mortar and rust. Also ideal for removing paint or oil stains from your driveway, excess mortar from bricks and rust from patio furniture. Preparing the surface for tile replacement is also a common application for this abrasive paper. Wood and metal flush cut blade is ideal for cutting doorjambs and baseboards for flooring installation. Used for precise cuts and plunge cuts. Wide 1-1/4" blade speeds through long cuts and can make plunge cuts up to 1-5/8" deep. Designed for cutting wood, drywall, plastic and soft metal like copper and 6d-8d finishing nails. The blade's tooth pattern is similar to a standard hacksaw blade. Bi-metal oscillating flush cut blade. Titanium coated for long life. Compatible for Fein, Bosch, Dremel, Rockwell, Porter-Cable and other brands. 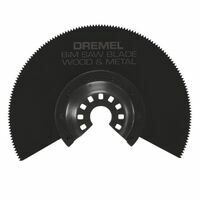 High carbon steel blade material for high performance wood cutting applications. Quick Fit system for fast accessory changes. Allows cutting the width of a 2 x 4. Flush cut blades are used to make precise cuts to allow for installation of flooring or wall trim. May be used on wood, plastic, drywall and other soft materials. 1-5/8" depth of cut. 1.25" width. Diamond coated semicircle saw blade. For removing grout, cutting and shaping plaster, porous concrete and masonry, scoring and cutting for precise fit. Universal fit system allow accessory to fit all major brand oscillating tools. Premium carbide teeth for long life in tough applications. Featuring Universal Fitment for adapter free use with all major oscillating tool brands. Durable enough to tackle tough jobs. Diamond grit for long life. Plunge cuts through plaster, light brick and grout. Thickness: 0.7". Carbide Zip Bit for ceramic wall tile, cement board, stucco and plaster. Ideal for cutting material up to 1" thick. High speed steel. For plunge cutting up to 1-5/8" depth on wood, plastic, fiberglass, nails, non-ferrous metals, thin sheet metal and hardened fillers. Universal fit system allow accessory to fit all major brand oscillating tools. For plunge cutting up to 1-5/8" depth on wood, plastic, fiberglass, nails, non-ferrous metals, thin sheet metal and hardened fillers. Universal fit system allow accessory to fit all major brand oscillating tools. Precision-ground, beveled tooth design allows for aggressive plunge cutting up to 1-5/8" depth on wood and soft plastics. Carbide oscillating blade for fast grout removal. Compatible with Fein, Bosch, Dremel, Rockwell, Porter-Cable and other brands. Precision-ground, beveled tooth design allows for aggressive plunge cutting up to 1-5/8" depth on wood and soft plastics. For sawing. Japanese teeth for precision cutting in hardwoods up to 1-5/8" depth. High-Carbon steel. 12 teeth per inch. For sawing. General purpose plunge cuts up to 1-5/8" depth in non-metal materials. High-Carbon steel. 12 teeth per inch. For universal use on almost all surfaces. High performance aluminum oxide abrasive and full synthetic resin bonding. Includes 10 sanding sheets of each grit: (60, 80, 120, 180, 240), unperforated, with hook and loop. The ideal solution for cutting flexible materials with your Multi-Max oscillating tool. Designed to cut when being pulled or pushed. Unique, hooked blade design allows one-handed cutting. Makes quick cuts in a variety of material. Makes cuts in difficult to cut, flexible materials. Use on carpet, vinyl flooring, asphalt roofing shingles, cardboard, foam insulation and plastic. All weather flexibility with working temperature range of -40 degrees to 164 degrees F. Heavy duty reinforced braided hose designed with contractor in mind. 300 psi max working pressure with 900 psi burst strength for toughness and safety. End restraints designed for longer hose life. Orange glo, long life engineered composition PVC hose. Spiral reinforced hose for durability. Nonconductive and oil and abrasion resistant; 1/4" NPT brass fittings on both ends. Selection of the 3 most popular Fein E-Cut saw blades for universal use. Ready for any sawing job. Combo includes: (1) E-Cut long life saw blade 1-3/8" and 2-9/16" wide and (1) E -Cut universal saw blade 1-3/4" wide. Carbide oscillating rasp for mortar and grout removal. Universal fit compatible with Fein, Bosch, Dremel, Rockwell, Porter-Cable and other brands. For cutting wood, wood with nails, drywall, pvc and metal (nails and staples). Bi-metal cutting edge for all-purpose applications. Segmented cutting edge, perfect for straight or flush cuts. Color coded interface and laser etched blade to quickly identify the right blade. Starlock interface for professional performance. Also works with OIS, compatible tools including Bosch, Fein, Milwaukee, Makita, Rigid and others. Precision Swiss made blade. Blade thickness: 0.125"; Blade length: 3.0". For sawing. Japanese teeth for precision cutting in hardwoods up to 1-5/8" depth. High-Carbon steel. 14 teeth per inch. For sawing. General purpose plunge cuts up to 1-5/8" depth in non-metal materials. 12 teeth per inch. High-Carbon steel. For long, straight cuts and cutting out installed parquet, laminate flooring and wall paneling. High-Speed steel. 12 teeth per inch. For sawing. Titanium enhanced Bi-metal for longer life cutting in wood with nail applications. 1-5/8" plunge depth. 18 teeth per inch. Multiple spiral polyester reinforcements. Kink resistant and flexible in extreme temperatures and brass NPT male fittings; 250 pound working pressure. Multiple spiral polyester reinforcements. Kink resistant and flexible in extreme temperatures and brass NPT male fittings; 250 pound working pressure. For sawing. Japanese teeth for precision cutting in hardwoods up to 1-5/8" depth. High-Carbon steel. 14 teeth per inch. For sawing. Titanium enhanced Bi-metal for longer life cutting in metal and wood applications. 2-1/8" plunge depth. 18 teeth per inch. For sawing. Titanium enhanced Bi-metal for longer life cutting in wood with nail applications. 1-5/8" plunge depth. 18 teeth per inch. For sawing purpose. For plunge cuts up to 1-5/8" deep. Includes titanium-coated, bi-metal blades with precision enhanced toothing for wood cutting and aggressive toothing for metal and nail cutting. For sawing. General purpose plunge cuts up to 2-5/8" depth in non-metal materials. High-Carbon steel. 15 teeth per inch. Flexible Hybrid Polymer material permits use in environments where general purpose PVC and rubber hose may become too stiff. Flexzilla hose characteristics offer zero memory allowing it to lay flat. It won?t work against you during operation and coils easily after use. It also offers extreme all-weather flexibility, even in subzero conditions, and is ideal in both hot and cold environments where tight radius bends are needed. Anodized aircraft aluminum ends. Max working pressure at 70 degrees Fahrenheit, 300 PSI. Oscillating blade assortment. Universal fit compatible with Fein, Bosch, Dremel, Rockwell, Porter-Cable and other brands. For cutting wood, wood with nails, drywall, pvc, metal (nails and staples). Bi-metal cutting edge for all-purpose applications including wood with nails. Curved Tec blade design for greater control and smooth, precise plunge cuts. Color coded interface and laser etched blade to quickly identify the right blade. Starlock interface for professional performance, also works with OIS compatible tools including Bosch, Fein, Milwaukee, Makita, Rigid and others. Precision Swiss made blade. Blade thickness: 0.125". Flush cutting blade with high performance carbide teeth for longer life. Users can cut hardwoods, nails, screws, stainless steel bolts, galvanized pipe, plaster and lathe, cement board, fiber board, sheet metal, slate, ceramic tile and more. It's wide 1-1/4" blade speeds through long cuts and can make plunge cuts up to 1-11/16" deep. Universal Quick Fit system allows this blade to fit nearly every oscillating tool on the market. For sawing. Plunge cutting up to 1-5/8" depth. Bi-metal with hardened, titanium-coated teeth for longevity. 18 teeth per inch.